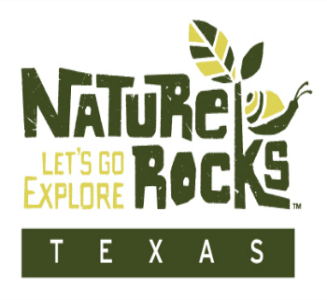 In 2009, the Texas Children and Nature program developed a website called Nature Rocks Texas. 10-It’s kind of a one-stop-shopping for families to find all of the nature centers, the zoos, the parks and green spaces that are near them, where they can take their families to get outdoors. enjoy, or to the perfect spot to get outdoors and play. 21-Sometimes people think nature is a faraway place; it’s something that have you have to kind of really plan to go do, and spend a whole afternoon driving somewhere to have these larger experiences. We want people to know that nature is in their community. It’s nearby them. It’s in their neighborhood. It’s around the corner. And you don’t have to go far to find it. Jennifer says before you think Nature Rocks Texas only focuses on Texas state parks and events organized by Texas parks and Wildlife–think again. 10-We also have our city parks, county parks, national parks, national wildlife refuges, nature centers. You name it; if there’s a nature component to it, it is listed on there. Jennifer Bristol returns next time to tell us how technology isn’t the enemy to the outdoors as once believed. This entry was posted on Friday, November 6th, 2015 at 12:00 am	and is filed under Children in Nature. You can follow any responses to this entry through the RSS 2.0 feed. You can leave a response, or trackback from your own site.